Tsuji Masanobu was the most notorious Japanese war criminal to escape trial after the war. Though only a colonel, he was a leading proponent of gekokujo, "leading from below" or "loyal insubordination." This was not an uncommon pattern in the Japanese Army, where it was unacceptable for subordinates to voice reasoned skepticism, but excessive displays of aggression were tolerated by superiors afraid of losing face. Tsuji also seems to have had political connections that allowed him to exercise control beyond his nominal rank. A member of the Control Faction (Tōseiha), he had played a role in averting a coup by members of the Imperial Way Faction (Kōdōha) in November 1934, and this seems to have made him a favorite of the future wartime Premier, Tojo Hideki. 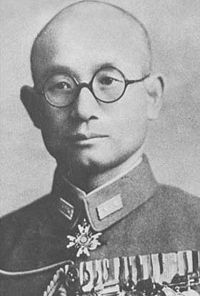 Tsuji was also a protégé of Itagaki Seishiro, who as a former Minister of War still had considerable influence in the Army. Tsuji was a staff officer with Kwantung Army from 1937-1939 and had a hand in the various border clashes with the Russians. He was infuriated that Army General Staff restrained Kwantung Army from forcibly seizing the disputed Kanchatzu Island on the Amur in the summer of 1937, an attitude he passed on to newer staff officers joining Kwantung Army. In March 1939, following the Japanese defeat in the border incident at Changkufeng, Tsuji led a force of 40 men to within 200 yards of the Russian border outposts, with their rifles slung over their shoulders to show a lack of hostile intent. Tsuji had the men line up, undo their trousers, and urinate in plain view of the astonished Russians, then sit down and eat a boxed lunch. After singing some military songs, the Japanese withdrew, leaving behind gifts of meat, chocolate, and whiskey for the puzzled Soviet troops. It was all an elaborate diversion staged to cover a thorough photographic reconnaissance of the Russian positions, meant to prove the Russians had encroached into unambiguously Japanese territory and shame the Army General Staff into authorizing an attack on the Russians. However, the Nomonhan Incident preempted any such operation. In the event of an armed clash, fight until victory is won regardless of relative strengths or of the location of the boundaries. If the enemy violates the borders, friendly units must challenge him courageously and endeavor to triumph in their zone of action without concerning themselves about the consequences, which will be the responsibility of higher headquarters. There appear to be certain differences between Army General Staff and this Army in evaluating the battlefield situation and measures to be adopted. It is requested that the handling of trivial matters in border areas be entrusted to this Army. This so infuriated the Emperor that plans were made to sack the responsible officers as soon as the immediate fighting was over. However, Tsuji had the patronage of the War Minister, Itagaki Seishiro, who saw to it that Tsuji was transferred to a research unit on Formosa rather than being cashiered. Eventually other friends in the Army were able to get Tsuji transferred to the operations section of the General Staff, where, in the words of Military Service Bureau chief Tanaka Ryukichi, he became "the most determined single protagonist of war with the United States" (Goldman 2012). During the final weeks of peace, he is alleged to have plotted the assassination of Prime Minister Konoye if the latter succeeded in arranging a last-minute peace summit with Roosevelt. It was the Ishihara-Tsuji clique — the personification of gekokujo that brought the Japanese Army to this deplorable situation. In Malaya, Tsuji's speech and conduct were often insolent, and there was this problem of inhumane treatment of Chinese merchants, so I advised General Yamashita to punish Tsuji severely and then dismiss him. But he feigned ignorance. I tell you, so long as they exert influence on the Army it can only lead to ruin. Extermination of these poisonous insects should take precedence over all other problems. Tsuji was associated with atrocities in Malaya (including the Alexandra Hospital massacre and the massacre of Chinese civilians in Singapore), the Philippines (including the Death March), and Burma (including the cannibalism of a downed American flier). He was intensely pan-Asian and contemptuous of all things Western. We honestly believed that America, a nation of shopkeepers, would not persist with a loss-making war, whereas Japan could sustain a protracted campaign against the Anglo-Saxons. Utterly cold-blooded and remorseless, and a misogynist who had tried to get female typists at the Army base at Davao recalled to Japan, Tsuji was also a gifted staff officer and helped set up the Japanese Army's jungle warfare school in Taiwan in January 1941. He was a lieutenant colonel and chief of Yamashita's Operations and Planning staff when war broke out, and the main architect of the Malaya campaign, for which he personally carried out much of the advance reconnaissance. His efforts at Nomonhan before the war, in the planning for the Kokoda campaign, and at Guadalcanal in 1942 were less successful. The signature of his handiwork was an emphasis on offensive and initiative and a disregard for conserving the lives of his men. For Tsuji, the chief and only guiding principle was military necessity. This included forcing officers who had been taken prisoner at Nomonhan to commit suicide after being repatriated, an action that helped establish the Army's brutal attitude towards surrender. His final wartime posting was in Burma, where his work during the fighting retreat from Imphal won the commendation of his superiors. However, even the hardbitten Tanaka Shinichi berated Tsuji for a lack of sympathy with his men. Tsuji was possessed of a twisted courage, as when he insisted on visiting the front line at Kokoda, only to be wounded in the throat by a bomb fragment when his destroyer was hit by Allied aircraft. The wound was relatively minor, but Hyakutake's chief of staff quietly advised Hyakutake to keep Tsuji at Rabaul lest Tsuji create more mischief in Tokyo. When Honda's headquarters was surrounded at Pyawbwe in April 1945, Tsuji reputedly stripped naked and took a leisurely bath in a well in plain sight of the Japanese troops in the area and while under enemy fire, as a way to forestall panic and restore morale. Tsuji was responsible for bringing down both Yamashita, who was posted to Manchuria, and Homma, who was forced into retirement. In both cases, the charge was that these officers had been too soft on the enemy. Ironically, both officers were later executed for war crimes. But Tsuji had an amazing talent for deflecting criticism to others. After the collapse of the Kokoda campaign, Tsuji told reporters at a press conference at Rabaul that the campaign was "A blunder. Cross the mountains and you'll get the worst of it. Don't you see that? A blunder" (Collie and Marutani 2009). Following the surrender, Tsuji escaped to Japan via Indochina and China disguised as a Buddhist priest. Arriving in Japan in 1949, after the Far East Tribunal had completed the trials of the major war criminals, he escaped attention from Allied occupation authorities and was elected to the Diet in 1952. The next year he founded a military rearmament society, denouncing the American presence in Japan and openly advocating for the rearmament of Japan in preparation for a second, final war with the United States. He was reelected to the Diet in 1956 in spite of being denounced for his war crimes by Kawaguchi Kiyotake. Tsuji wrote a number of books and articles on his experiences, of which his account of the Malaya campaign from the Japanese side has received the most attention from Western historians. His writings should, however, be taken with a grain of salt. In a bizarre twist, recently declassified CIA files show that an attempt was made to recruit Tsuji as an intelligence agent after he came out of hiding. However, he proved useless, the CIA concluding that "In either politics or intelligence work, he is hopelessly lost both by reason of personality and lack of experience... Tsuji is the type of man who, given the chance, would start World War III without any misgivings" (AP 2007). Tsuji never returned from a trip to Laos in 1961, and it was rumored that he had made the trip to advise the Viet Cong.